The answer to “Can we feed nine billion people by 2050?” is “Yes!” Will we feed nine billion people by 2050? That is a different question! It will all depend on everyone’s attitude. “We Will Reap What We Sow” will focus on the human factor. Indeed, our attitude and the way we deal with problems will play an essential role in future decisions. The consequences of these decisions will shape our future world. Success or failure depends mostly on us. The current level of technology, combined with the amazing developments that we can expect in the coming decades, is not the limiting factor. Our ability to act for the common good will determine our fate. For those who have read Future Harvests, this next book will be a useful sequel focusing on human nature, behavior and leadership. The book will start where Future Harvests ended. This new book will review the interaction between human population, and their leaders, with all other aspects that contribute to food production and prosperity of societies. Those who will not have read Future Harvests will it a stimulating ground for discussion, and hopefully a reason to read my first book, too. 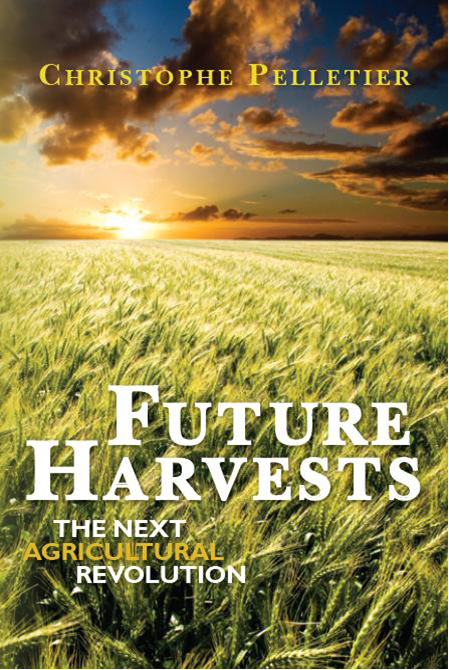 Anyway, they still have enough time to order Future Harvests and read it before We Will Reap What We Sow is published. “We Will Reap What We Sow” will address the major questions that need to be answered, and discuss the pros and cons of the different points of views. It will indicate what the most likely consequences of the different scenarios might be. Human nature being what it is, the book will also focus on how to develop positive incentives and reduce the possibility of negative stimuli. There will be a balanced discussion between economic, scientific, philosophical, and moral parameters; and how they contribute in building prosperity. The book will be an exercise in foresight. The book will also focus on leadership. It will review what expectations of leaders will be. How leaders can help humankind overcome the fear of change and make the transition to a more food secure world. Dealing with change will be a major part of building the future world. Just as much has changed over the past decades, much will change in the future. The coming changes are beyond what most of us can imagine. Yet, it will happen. We had better accept it and prepare to adapt. Unlike most of the articles published recently about the seventh billion human on Earth, “We Will Reap What We Sow” will not look for sensationalism. Doing that is quite easy, but not productive. Just like Future Harvests, it will explore the possibilities. It will focus on solutions, not on problems. There is no point of mongering fear. Leaders are there to help people dare and succeed, not to hide afraid or give up hope. The task ahead is not easy, but it is not impossible. Only by realizing the benefits for all of responsible and collaborative action, will humanity ensure its future food security.